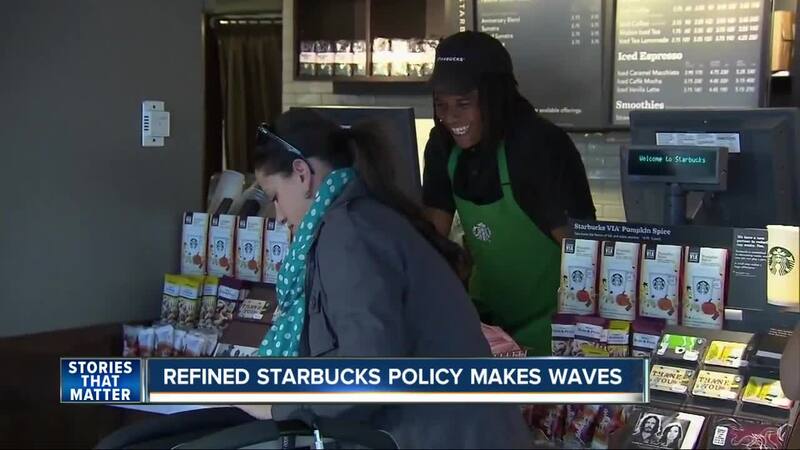 Revised Starbucks policy calls anyone a "customer"
SAN DIEGO (KGTV) - Starbucks customers are noticing a difference since employees were notified Friday of a revised customer policy, acknowledging "any person who enters our spaces, including patios, cafes and restrooms, regardless of whether they make a purchase, is considered a customer." This comes a month after two men were arrested in a Philadelphia store, sparking national outrage . "They're trying to make sure they fix the problem and everything and keep everything straight because they're not trying to be racist, I think," Customer Maurice Howard said. Every customer who spoke with 10News Sunday said they were happy to hear about the revised policy, hoping what happened in Philadelphia will never recur. Customer Francisco Ruiz said the coffee shops provide a service for the community, a notion echoed by the company's vision to create a " third place between work and home ." It's no secret students see Starbucks as a study sanctuary. Others, like Yvonne Pardo, conduct business at some of the chains out of convenience. "I'm a hiring manager for a local business and I do my interviews at Starbucks," Pardo said. When she learned of the arrest in Philadelphia, she still came in to conduct interviews, but didn't buy anything to see what would happen. "Obviously I was impressed at the fact that I wasn't asked to leave, and I was there for four hours one time... Knowing that they changed their policy, I'll probably be more likely to be a patron again," she said. The new policy, meant to be more inclusive, could be abused. "I was at Starbucks yesterday and there was a loiterer and I thought about that and I was like, now they probably can't ask this person to leave, and he was sleeping," Pardo said the person was homeless. "You got a lot of people who want to kick it and chill and stuff like that so it'll probably be overcrowded, a little bit bad for business," Howard said. The new policy does address disruptive behavior instructing employees to call 9-1-1 and follow procedures to bar a customer from the chain if necessary. The complete revised Starbucks policy is online.